From rowing across the Atlantic Ocean to building a flying car to fighting for political change, there are endless ways to spend a gap year. 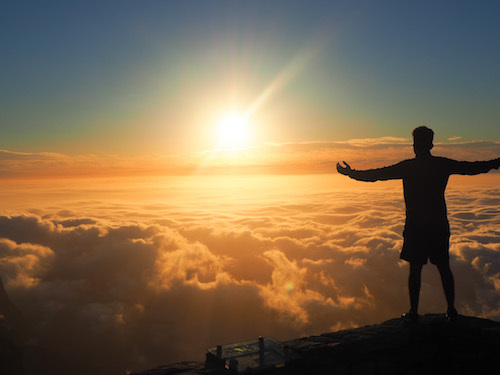 More students every year are choosing to take a gap year after high school, but some lament it’s difficult to find resources and other students who are also making that choice. Gap Year Exploration Month seeks to empower students to understand the vast array of opportunities available for gap time and research paths that are right for them. Behind this initiative is a passionate group of educators, program providers and others who want to help promote the benefits of gap time. So how can you get involved, you ask? There are many ways! See below for opportunities on how to #explorethegapyear this February! February is all about getting inspired by the possibilities. For starters, check out this list of gap year events happening across the US (and world!). There you’ll find in-person events like Gap Year Fairs as well as virtual events like informational webinars, Twitter chats and livestreams happening just about every day or the month. Have you taken a gap year? Whether it was last year or twenty years ago, chances are your gap year had a lasting impact on you. We are encouraging alums to talk about their gap time on social media using the #explorethegpayear hashtag. You could also write into your local paper about what your gap year meant to you or offer to speak at your old high school. Take a look at this handy toolkit for more ideas on how to encourage others to take a gap year. Educators who teach and counsel young adults have a tremendous opportunity to offer information about taking a gap year during Gap Year Exploration Month. 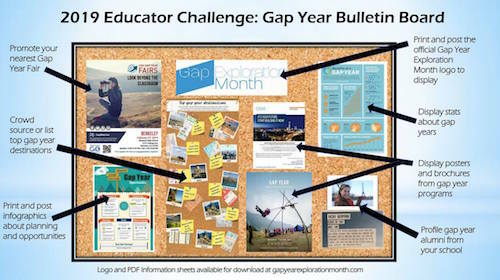 One easy way to engage students is to create a gap year information bulletin board in your school’s hallway. Take a look at the educator toolkit for examples of how to bring that to life. Be sure to share your masterpiece using #explorethegapyear! Dozens of programs will be hitting the road for the Gap Year Fairs tour in February, running promos or hosting their own events. If you are interested in joining in the fun, let us know how you are participating by using #explorethegapyear and see your own toolkit here for more ways to engage. We invite you to join in this month-long event to spark your curiosity, learn, dream big and consider taking the leap into a gap year! See you there! This entry was posted in Gap Year Benefits. Bookmark the permalink. ← Travel Access Project Grants for Gap Year Travel: Accepting Applications!